There's so much I'd like to be able to tell you about Singapore and all Ben and I have been learning and experiencing - I wish you could all be here. Sadly it's been hard to get a wireless connection here so I haven't been able to blog as much as I'd hoped. I'll share much more when I get back, (faith for bigness, hospitality, engaging with culture, and creativity amongst other things) but as I've found a wireless connection I wanted to share a little bit on generosity which has been one of the major themes. That the Bible teaches so clearly that we reap what we sow, but that in order to sow you have to give away what you have and that until you give it away you can't begin to do any reaping. But that if you are willing to let it go, just as the boy did with the 5 loaves and 2 fish, then God can do amazing things. I know for me God has spoken to me so clearly about financial generosity and sowing, and this weekend as we come to the last Sunday of the gift days I want to encourage you to sow generously. If you haven't already given then please think about what God wants you to sow, and if you have given ask God if he wants you to give more. Together we can do something amazing. Yonggi Cho has just started speaking so must go now. Can't wait to see you all again when we get back. In about an hour I'm heading off to Heathrow to spend a week in Singapore. Earlier this year Ben Davies and I got to have lunch with a guy called Kong Hee, who leads City Harvest Church in Singapore, and he invited us over to his Asia conference. I've got no real idea what its' going to be like, but with speakers including Yonggi Cho and Reinhard Bonnke and Kong Hee leading a church of 32,000 my expectations are pretty high! I never look forward to being away from home, especially after such a great weekend celebrating Catrina's birthday and hosting Steve Gambill and RPM (weren't they great), but in my passion for us to be a church of thousands which plants churches of thousands moments like these feel like opportunities not to be missed. Please pray that Ben and I have a fantastic time and manage to bring back all that we learn and experience. I'm hoping to blog and tweet lots whilst I'm away so hopefully you'll get at least a flavour of what we're up to. Have a great week. 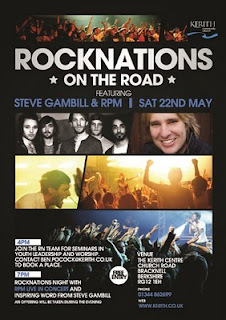 This weekend we are privileged to have RPM and Steve Gambill from Abundant Life church in Bradford with us. 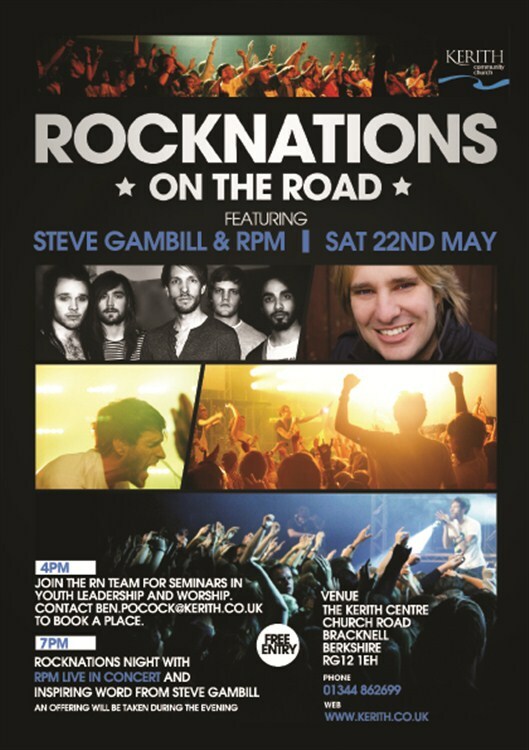 On Saturday they're going to be running seminars on youth leadership and worship from 4pm, and then from 7pm they'll be doing a live concert and Steve will be preaching. More details and a form to sign up for the seminars are here. Please note there's no parking (other than for elderly and disabled) at The Kerith Centre or Avis for the Saturday, use Charles Square car park which is only a short walk away. On Sunday morning RPM will be leading worship and Steve will preach in both meetings, then in the evening we'll have our band leading worship and Steve preaching again. It's going to be a great series of events for both the young and the young at heart. If you want a bit of a taster then catch this youtube clip which tells you a bit about their church and the heart behind their new CD. I read somebody recently saying that video is the stained glass window of the 21st Century. It's certainly a medium which we can use to spread the message of Jesus Christ and what His church is up to. Every now and again I get asked to speak on video and thought you might be interested to see a couple of them, not because they feature me (I so hate hearing my voice - do I really sound like that! ), but because they talk about the impact we are all having as a church community. The first is me chatting with John Burke when he came over recently, the second is something I did for CAP talking about the impact our CAP Centre has had. If we're going to connect with our 21st century society then we increasingly need to use video to communicate the message of the gospel. On Sunday as part of my message on the volunteer revolution we'll be showing two videos. One is very funny and was produced outside of Kerith, the other was done in house and moved me to tears the first time I saw it - don't miss them! At the start of the year I spoke about being able to choose where you're planted in life, and spoke about five areas in life where you can truly prosper if you make the right choices (faith, finance, friends, fitness and people far from God) . One of those choices was around fitness, and I said that I felt this was the area God was most highlighting for me in 2010. Since doing the London Marathon 14 years ago I've basically done nothing regular to keep fit. 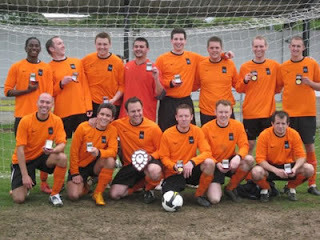 To try and improve I entered the Bracknell Half Marathon, as I knew that without a goal I'd never actually do anything! Well having done the half marathon yesterday I can say that it was truly a great event. The last two miles were pretty grim, but the feeling of achievement crossing the line was huge. I was hoping to do it in under two hours, which I missed by 17 seconds, but I'm not too fussed as I achieved my other goals of a) actually getting to the finish and b) doing it without stopping. Congratulations to other Kerith and associated runners who made it round - in no particular order the ones I know of are Andy & Ruth Jackson (and their sister Rachel), Ben Pocock, Andrew White, Tony Pudner, Robin Findlay, John Stone, Andrew Mitchell and Dave Roper. I now intend to keep it up by doing an organised run in June and then another half marathon later this year. by now. I'm convinced that the reason I haven't is the sharpness and increased energy which has come from being physically fitter. So here's my encouragement. Make some decisions that will see you well planted physically. It might not be realistic for you to run a half marathon, but you might need to think about walking rather than going by car, doing some sport, joining one of the church activity groups (football, women's walking and running groups, badminton and others) or improve what you eat. Well after the excitement of seeing Elbasan win last Saturday comes our very own Kerith team in the local church league Cup Final this Friday at 7.30pm. The game is being played at the home ground of Reading Town FC - directions are here. The game is against Bethel United - I know the guys will really appreciate anyone who can get over there to support them. I woke up at 4am this morning feeling anxious about a whole load of things. What is going to face me in the church office today after a week out of the country? How will tonight's elders meeting go? Will the lifegroups coming round on Wednesday and Thursday evenings have a good time? How is the half marathon on Sunday going to go? A flood of different thoughts. It's not as though there was anything definite to worry about - I just had this overwhelming sense of feeling anxious and worried. Then as I lay there I remembered 1 Peter 5:7 - "Cast all your anxiety on him because he cares for you". I've never been quite sure how you cast an anxiety, but I began to think of each of the things I was worrying about and to imagine handing them over to Jesus. Saying to him with each one "I'm going to trust you with this, confident that you care for me more than I will ever know". And as I did that with each one the anxiety over that thing just went. Once I'd been through everything on my mind (there were quite a lot of things) I just went back to sleep and woke up at a much more normal time. I'm not sure why but I felt I'm not the only person who woke up feeling like that today, and that I needed to write this and encourage you to do this too if you're feeling worried or anxious. Just so you know I'm now feeling very relaxed, sitting in our conservatory writing this before heading off to a day full of possibilities at the office.